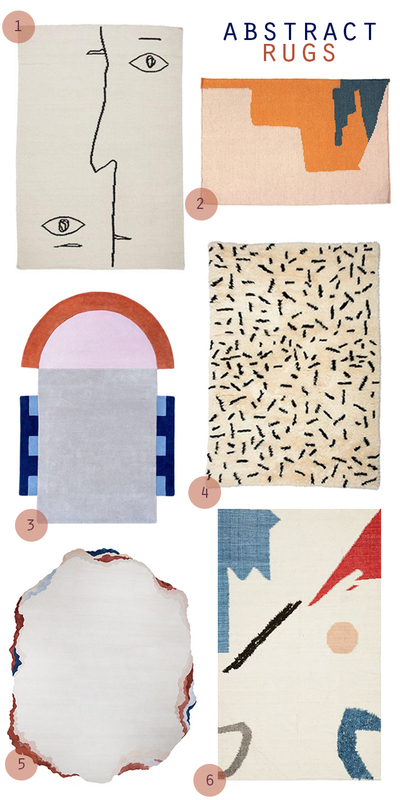 We’ve been seeing a lot of rugs lately that look like they could belong on walls. Mirroring abstract art and full of bright colors, these accessories are a playful addition to any contemporary home. They have a strong 80’s-90’s vibe to them and remind us a lot of the Memphis design trend that was popular during that time period. Spacey, geometric patterns that focus on primary colors… you remember it. But these designs have a fresher look on that iconic style using pastels and earth-tones as well as incorporating more fluid lines. These styles are definitely for the edgier client looking to add a whole other dimension to their space. But they’re still so simple and neutral, that they don’t take too much attention away from the furniture and architecture of the home. The rounded rug (#5) is a uniquely stunning piece that we would love to see in our next project. The edged layers creates a 3-D effect and those contrasting colors work so well together. Abstract rugs could definitely be a fad and they are certainly not for everyone. But you have to take a minute to admire the contemporary art of it all.